SAN DIEGO -- Two coaches were standing in the rain on the Rancho Bernardo High all-weather track, watching as a decision was being made whether to continue the pole vault or cancel it. "If Tom Martin says it's OK to vault, they'll vault," said one. "You don't argue with Tom Martin." 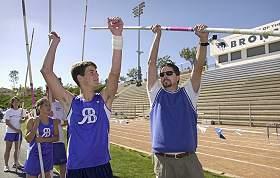 That's what's known as respect for the coach many call the 'pole vaulting guru'. 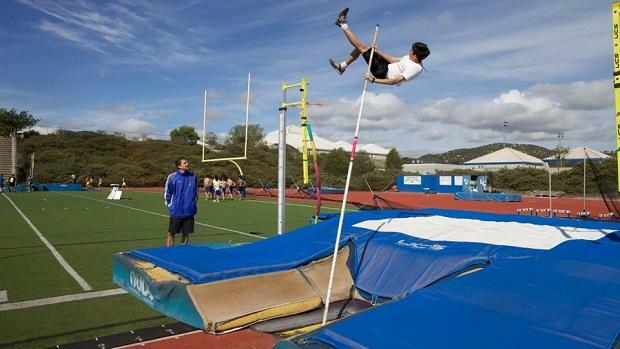 For 36 years Martin has been teaching high school athletes the nuances of the pole vault. He has produced three California state champions at Rancho Bernardo and one year his women went 1-2-3 at the Junior Nationals -- a feat never before accomplished. Of the Top 30 San Diego Section boys who have cleared at least 15-6, nine are from Rancho Bernardo. On the girls' side, the Broncos have nine girls who cleared 12-feet, including five of the top eight. Vaulters like Billy Matthies (16-1 in 2003), Ryan Zacchelli (16-0 in 2012) and Matt Steverson (16-0 in 2004) as well as Tracy O'Hara (13-3 in 1998), Emily Mattoon (13-0 in 2007) and Kathleen Donoghue (12-8 ½ in 1999). Not bad for someone who knew nothing about the event. "Way back in 1983, I was asked by Don Jones when he was at Monte Vista (Spring Valley) if I'd coach the high jump and pole vault. I was so excited for the high jump but the pole vault thing..." said Martin, 60, his voice trailing off. "I did it in high school but I wasn't any good." His response, though, was typical. Since he felt he lacked the knowledge in the event, he buried himself trying to learn whatever he could. Martin attended clinics, read everything written about the event, watched endless vaulters and became so proficient that when 70 vaulters came out for track in 2003, he decided it was time to jettison the high jump. Martin has a system in place starting from the very first day through week one. After that, he pretty much can tell whether the individuals trying out are really made for the event. "In PE class (he's a PE teacher), I ask any freshman who wants to try it to get up on a table in front of the pit," Martin explained. "I just ask them to hold onto the pole and swing into the pit. "By the time they hit the pit I know if they're pole vaulters or not. A lot of them don't even want to try-they're definitely not pole vaulters. "I tell them it's like the old E ticket at Disneyland, giving you the ride of your life. Kids like the feeling of flying through the air and when they start to bend the pole and get catapulted, the pole vaulters are hooked." It doesn't always work. He recalls one boy-he coaches both boys and girls with equal success-who he thought had the makings of a 15- or 16-foot vaulter whose parents stepped in and told him there was no way their son was going to pole vault. But he also mentions that although there are a couple of key ingredients in the makeup of a pole vaulter-speed on the runway being the most important-sometimes the athlete will surprise you. "We had a boy I never thought would amount to much when I saw him as a freshman but by the time he was a senior he was one of the best," said Martin. "You never know." He starts everyone at the same height-5 feet. It's the lowest the standards will go but they progress from there. Although it's rare, by the end of the first week some of the first-year boys are up to 10 feet and Martin knows he has a vaulter. Then there are the dramatic improvements. Kathleen Donoghue, who went on to win the state in 1999, cleared 8-6 as a sophomore and soared over 12-4 a year later. "That's almost a four-foot improvement," said Martin, still a bit in awe. A Martin practice session will be broken in four groups with two working in the pits and the other two working on mechanics outside the pit. Mechanics like practicing running with the pole and making sure your step is perfect every time. It's the same as a long jumper, only then you have to plant the pole and finish the vault. Martin says one of the hardest thing for vaulters to learn is to be comfortable riding the pole, getting upside down and then turning at the top. Most difficult is the turn and often the vaulters just can't master that phase. Why? Fear. It's a major factor in pole vaulting and it's very real. Martin says while he thankfully has never seen a fatality, he's witnessed enough serious injuries to know that one mental lapse can be disastrous. He's seen vaulters completely miss the pit and land on the ground outside the back or side. He's seen them come down in the box or even on the runway. That's doesn't even count the vaulters whose poles have snapped and sent them flying, almost always into the pit. He's also seen vaulters who have suddenly frozen in fear and simply can't ever vaulter again. "It's like what they say about falling off a horse, you have to get right back on," Martin said. "The longer you wait after a crash, the more fear you have. "It isn't just newcomers. I had a 14-foot vaulter who for some reason picked up the wrong pole and went completely out of the pit, landing on the ground. He had to take a few weeks off because he suffered a concussion. I never did understand how he could grab the wrong pole." Although Martin is respected at the highest level, including being invited to the Olympic Training Center to coach with the likes of Stacy Dragila and Dave Nielsen, he has never tried to make a bundle of money off his knowledge. "I've don't have a clinic and I'm very loyal to my vaulters, so I don't coach others on the side," said Martin. "I've probably cost myself thousands and thousands of dollars but I'm fine with that. 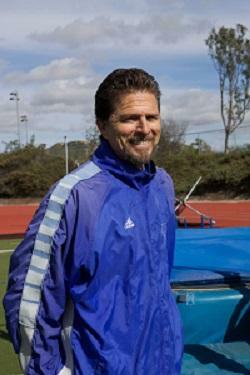 "That said, I've always encouraged my vaulters to go to camps, to learn all that they can about the event. I've had average vaulters go (to clinic) and come back much better." "Oh, one of them said he didn't think I was much of a coach because this other guy taught him something that I didn't. What it was is the other guy just used a different word for the same thing I'd been trying to teach him all along. It didn't matter to me as long as he got better." Martin says the reward is taking an athlete who has never done anything and watching him or her progress until they're successful. "It's the satisfaction you get knowing that you were responsible for helping," he says. "It's not like basketball and baseball where they come to you with years of experience at the youth level. These are kids who have never vaulted before. It doesn't matter what the height is, just that they feel successful." Meanwhile, back in the rain at Rancho Bernardo, Martin finally was forced to stop the competition. "When my best vaulter said his hands were slipping on the pole, I knew it was time to stop," Martin said. "It wasn't safe."